I like the house to look dressed for Christmas, but I don't like a lot of extra things strewn around. Too busy for my eye, too crowded to live with. Instead of *adding* Christmassy things, I like to edit the house to make it look festive. The stack of dishtowels folded by the sink? If I take out the blue and yellow ones and tuck them away for the month, I have a stack of red and white. Topped with a useful tub of peppermint hand cream, this looks deliberately Christmassy. A quick switch of quilts, from autumn colors to the red-and-white schoolhouse quilt. 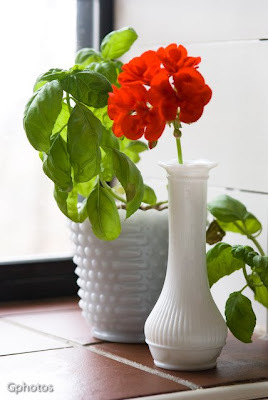 One cutting of red geranium turns a pot of basil into a holiday decoration. Pure white flowers in the living room. By putting away all my pink and blue aprons, and pulling out my three vintage Christmas aprons, my hanging display is deliciously decorative. A stack of red books on the coffee table. Oh...you sound like an expert decorator/organizer. I like the idea of subtracting. Now that is a common sense method to seasonal decorating! I'm with you... too much clutter clutters my mind. Good ideas. That green waffly towel looks exactly like some I got from JC Penney a few years ago. oh now that is SMART. I will keep that in mind for next Christmas AND other seasons/holidays. I love your take on decorating Anna. I find the very idea of changing everything for a season or a holiday quite overwhelming. You've made it simple but still quite effective. You sound like my kind of girl! I'm do glad I'm not the only one who doesn't enjoy the extra clutter of Christmas decorations! My tree,nativity and a few items on the mantle are all I need. When I entertaining I use Christmas serving pieces. Now what do with all the tchotskies received as gifts? This is what I have done for many years as well. When I empty my Christmas decoration boxes I immediately fill them with things that I wish to tuck away to make room for my Christmasy things. I must subtract before I can add my decorations. Too much clutter clutters my mind. I don't think I've ever posted here, but I absolutely love looking at (and reading) your blog! Your photographs are just stunning. I love your idea for Christmas decorating. We are anticipating a move soon and I don't want to pull out what little I do have. Your ideas make perfect sense!!! Plus they are frugal, even better! I like the idea of keeping it simple. I hate clutter and have cut back on my decorating this year. I can't go with out my trees though.. I have three and love them. I also love my nativity scene that I keep under one of my trees. Sounds nice and peaceful. It is a way to be festive, without any extra work! We do add greens to our home, and white lights but I try to keep it simple yet, meaningful. What simple ways to decorate for the holidays. 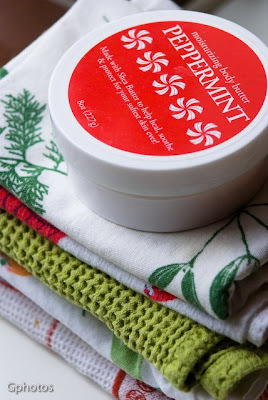 I must ask where you got the peppermint hand cream!?! Yummm! I just LOVE your blog and all the beautiful, clean photos. This is a great idea, as we are getting ready to sell our house and I've been trying to figure out how to decorate with adding clutter. This year at Christmas time is the first year that I realized that to avoid the crazy cluttery feeling mentioned by so many, I must replace my regular house decorations with Christmas decorations rather than add them all in together. I'm SO thankful for this light bulb moment! I'm thinking that a little "editing" could help, too! Thanks for this post--to remind us how to focus on the important things at Christmas...not the excess! Thank you for such pleasing simplicity. Clutter is exactly what keeps me from "decorating" for the holidays. Although some house are filled and looked splendid, it is just to much to keep track of and store for me. I wish our thrift store had such finds. I envy your stash just a wee bit. I like your decorating philosophy. It sounds clean and fresh. Starting to think about Christmas and this post came across the screen today. Wonderful thinking! So I pinned it, hopping that's fine with you, or do we need to ask permission first? Thanks for asking, but feel free to pin away without specific permission. Have fun!